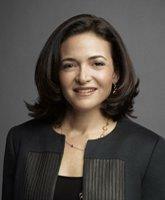 Sandberg Named to Facebook Board: Could the Gender Gap in Silicon Valley Be Shrinking? Facebook COO Sheryl Sandberg became the first female member of her company's board of directors on Monday, a move that many in Silicon Valley saw as a long time coming and one that finally shakes up the male-dominated board that has led the social network since its earliest days. Sandberg has been with Facebook since 2008 and serves as CEO Mark Zuckerberg's second in command. She joins Zuckerberg on the now eight-member board, which also includes Netflix CEO Reed Hastings, Washington Post Co. chairman Donald Graham, former White House chief of staff Erskine Bowles and venture capitalists Marc Andreessen, Peter Thiel and James Breyer. "Sheryl has been my partner in running Facebook and has been central to our growth and success over the years," Zuckerberg said Monday in a statement. "Her understanding of our mission and long-term opportunity, and her experience both at Facebook and on public company boards makes her a natural fit for our board." The appointment came as welcome news to the legions of Facebook users and shareholders who for months had been pressuring the company to diversity its board. Protestors delivered a petition signed by some 53,000 people to Facebook's New York City offices in March, calling on the company to name a female director, and the California State Teachers Retirement System (CalSTRS), a major Facebook shareholder, lamented the lack of female representation in a letter to the company earlier this year. "We are disappointed that the Facebook board will not have any woman members," wrote Anne Sheehan, CalSTRS director of corporate governance. "This is particularly glaring at a time when there is clear evidence that companies with diverse boards perform far better than the companies with more homogenous boards. [A] diverse board makes good business sense." However, Zuckerberg appeared to be in no hurry last summer when the New Yorker's Ken Auletta asked him why there were no women on the Facebook board. "I'm going to find people who are helpful," Zuckerberg said, "and I don't particularly care what gender they are or what company they are. I'm not filling the board with check boxes." Sandberg, who effectively runs Facebook's day-to-day operations, is apparently now considered officially "helpful." But does it really matter? Jeffrey Goldfarb with Reuters Breakingviews is not convinced, pointing out that Mark Zuckerberg still controls the majority of board votes, thanks to Facebook's corporate structure, so Sandberg's presence in the boardroom will likely have little impact on the company going forward. "It seems more likely that Sandberg will enhance the diversity statistics without truly advancing the cause of diversity," he writes. Of course, prior to Sandberg's appointment, Facebook was far from the only technology firm being led exclusively by men. After all, Silicon Valley's "boys club" reputation is well deserved, and women are generally underrepresented at the director level across the business world. According to a report from Catalyst, a group that studies the role of women in the workplace, women accounted for just 16.1 percent of corporate board seats at Fortune 500 companies last year, with the United States ranking fourth worldwide in terms of female board representation. Norway ranked first in the Catalyst study with 40.1 percent of seats going to women, followed by Sweden and Finland. As for the tech industry, though, there are still some well-known names among the last "men" standing, according to Forbes. The boards of Zillow, Zynga, Adobe Systems, Pandora and Foursquare all lack female representation, while Apple Groupon and LinkedIn all have only one woman board member. What do you think? Are you frustrated by the lack of women on corporate boards?